Aim: Liver resection is considered as one of the most formidable surgeries and laparoscopic resections for the same is considered as the last frontier in laparoscopy. 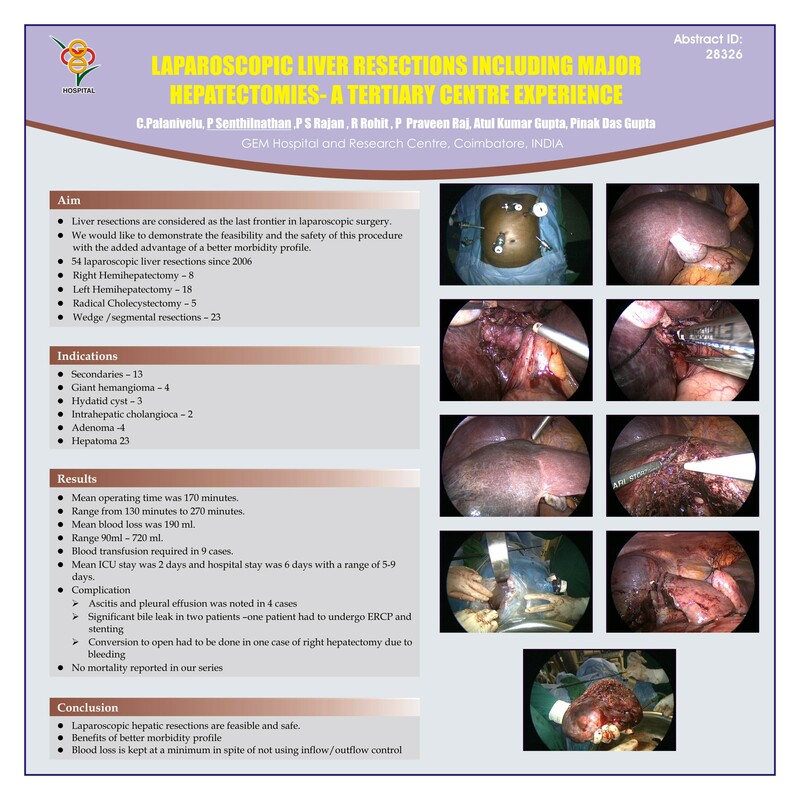 We would demonstrate the feasibility of laparoscopic liver resections emphasizing the excellent morbidity profile. Methods: Since 2006 we have performed 54 laparoscopic liver resections for malignant and non malignant diseases in normal and child A chirrotics, 8 were right hepatectomy, 18 left hepatectomies, 5 radical cholecystectomies and 23 were wedge / segmental resections .Surgery starts with the control and ligation of the vessels and the biliary ducts in cases of major resections. Parenchymal division is then started after the vascular demarcation using ultrasonic shears or monopolar electrocautery. CUSA is used for the parenchymal disruption. Small vessels are sealed and divided with bipolar and ultrasonic shears. Medium vessels and bile ducts are clipped and divided. Vascular staplers are used on the hepatic veins. The specimen is extracted in an endobag through a pfannensteil incision. No vascular isolation technique was used in any of the cases. Results: Mean operative time for major resections is 170 minutes and blood loss 190 ml. Blood transfusion was necessary in 9 cases. Mean hospital stay was 6 days. Four patients developed ascitis with pleural effusion and two developed significant bile leak which was managed conservatively in one and other had ERCP and stenting done. Conversion to open surgery was done in one case of right hepatectomy due to bleeding. There was no mortality in this series. Conclusion: Laparoscopic liver resections is feasible with a better morbidity profile .Thorough knowledge of the newer hemostatic and parenchymal split instruments is necessary to reduce blood loss and morbidity .